I've been having a lot of fun making tracings of John Langdon's ambigrams. As I wrote in a recent post to a forum devoted to discussion of the novel Angels & Demons (along with other Dan Brown novels), the real trick to designing something that looks good is not simply tracing an outline. The small GIF files on John Langdon's site lack sufficient detail to be scaled up without losing quality. The mind makes lots of assumtions about what a character looks like, even if the letter is very small. When a raster image has been scaled up and the basic outline traced, the small details must be added in a way that is consistent with the mind's assumptions so that they look smooth and natural. I had to make some assumptions about how the small details are supposed to look. I guessed based on what feels right, and on the particular style of gothic calligraphy employed by J.L. in his designs. Given the fact that I've had to make some educated guesses, I am sure that my drawings differ in some ways from J.L. 's originals. One helpful tip to prospective ambigram designers is to look at how many ways a letter can be written. There are many variations for each letter; some can be reversed more easily than others. 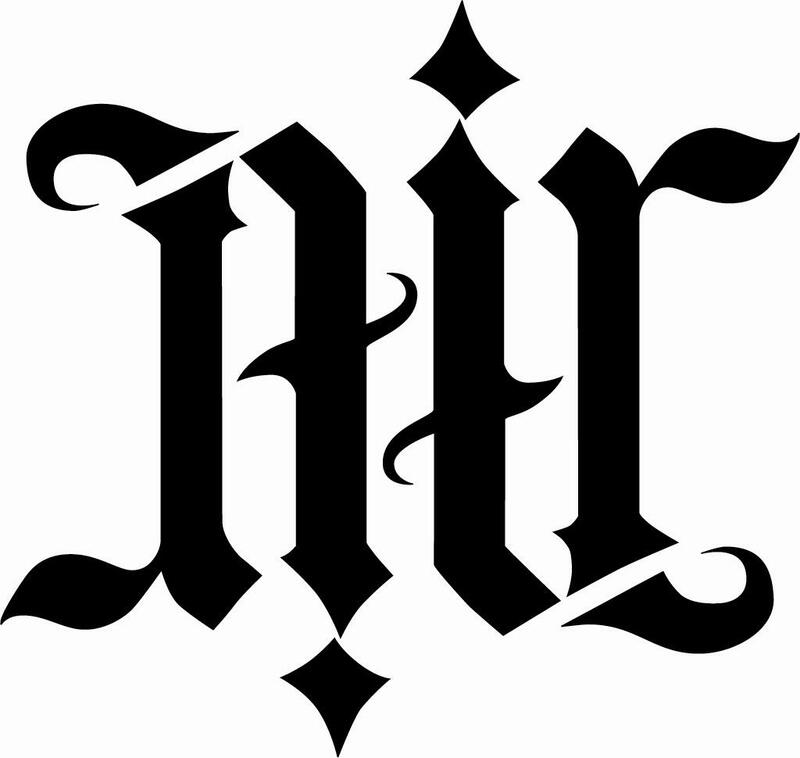 In the course of trying to find out how the fine details of each of the letters in these ambigrams should look, I found it very helpful to look at samples of gothic calligraphy on the internet. The drawing tools are actually not as difficult to use as I thought they would be. This exercise has illuminated the art of designing ambigrams in particular, and has also given me some insight into some general principles of drawing. It has been a lot of fun and I'm sure I'll be designing more of my own ambigrams in the near future based on what I have learned.